If you're like me, you want a hook for your poetry unit. Something students can grab ahold of when poetry feels too disconnected from their lives. I'm here to offer you that very hook. It's called poetry slam. I have a feeling you've heard of it, but have you tried it yet? And if not, WHY NOT? Last month I wrote a post all about how to do it, so today I'm going to focus on ten amazing video clips you can use as part of your slam unit. If you're not ready to dive fully into slam, you could also easily use them to complement a traditional poetry unit. In my slam units I sprinkle video clips throughout the week so that students can practice judging poems. I play the video, then ask everyone to silently give it a score 1-10 and prepare to defend that score. Then I start calling on people. It's always so. much. fun. One student may rate a poem with a one that five other students thought was the best ten they'd ever seen. The debate that follows is exactly the kind of engagement I love. Bottom line, in poetry slam, there are no rules. The audience loves what they love. 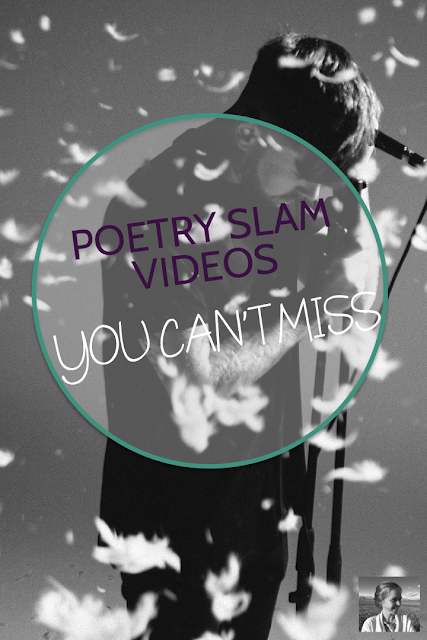 I find that sharing videos of eloquent slammers inspires my students to move in new directions with their poetry. The quality of poems they slam every year astounds me. We do several writing workshops in class but because they are so engaged with the slam format and want to perform something excellent, they spend many hours working on their poems outside of class too. In this post I'm going to share some of the most outstanding slam videos I've seen in my ten years of searching. And for each, I'm going to offer you a brief prompt you could share with your students in a writing workshop after watching and scoring the video. I wouldn't recommend doing them all, but if you choose several that you believe your students will connect to, I think you'll find this a very productive way to inspire writing. This video is from the documentary film SlamNation. Many clips from this film are available on youtube and lots of them are wonderful. "Love" by Alexandra Oliver is one of my favorites. Students have hugely varied reactions to her purposely awkward delivery style and hilarious overarching comparison. Let them feel uncomfortable at first and then start to realize it's supposed to be funny. Prompt: Alexandra Oliver compares love to stale twinkles. Talk about a striking, unusual choice. Write a poem around one big simile that will surprise people. Stick with the theme of love, or branch out. Just choose something surprising for your simile. For example, "slam poems are like omelettes..."
In this clip, Smokey Robinson comes on Def Poetry Jam to share a poem about the different language used to describe being black through history, and what that language does or does not mean. Prompt: Smokey Robinson uses his poem to talk about an aspect of his identity. What's a part of your identity that you could write about? It could be anything - your heritage, your beliefs, your dreams, your friendships, your passions. Try to explore this part of yourself through many different types of small stories, examples, and lenses the way Robinson does. Heads up, this poem, "Sign Language" by Rives, has several swear words but they are not particularly offensive. I find this poem very striking, and I think your students will too. It's about his experience doing poetry slam at the high school for deaf students where he works. Prompt: Rives explores a topic most of his audience know nothing about. What's something you know all about through experience that no one else here does? I bet there's something. Write a poem about it. Use specific anecdotes and descriptive details to bring it alive, because you're the only one who can do that for us. Blythe Baird's "When the Fat Girl Gets Skinny" comes from a good series called Button Poetry. It's about disordered eating. Prompt: Baird explores a very personal theme, using many small details from her own experience. Write about something personal to you, and include at least ten specific details from your own experience as you explore the topic. You don't every have to show this poem to anyone if you don't want to. Taylor Mali is one of the most famous slam poets, and he really gets into his piece "Like Totally Whatever," featured in SlamNation. Some students love it, some think he goes too far. You might also enjoy checking out "What Teachers Make" and "I Could be a Poet," also by Taylor Mali. Prompt: Taylor Mali has a pet peeve. Do you? Write a poem in which you dig deeply into your pet peeve. What exactly is it that drives you so nuts about it? Why does it matter? Be specific. Use original language. Don't be afraid to be funny. Jack McCarthy blends humor and sincerity in his slam piece "Boys Don't Cry." This one gets a range of student responses, and that's just one of the reasons I think it's well worth sharing. Prompt: Jack McCarthy breaks apart a common statement with his poem "Boys Don't Cry." What's something you hear people say that you think is absurd? Write a poem to disprove a commonly held belief or trite saying. Sprinkle in striking description and details from your own experience. I hope you find the time to incorporate some slam into your unit, or go full steam ahead into poetry slam. I've done it every year of my teaching career and LOVED it every time. If you're diving in for the first time and could use some support, I'd be glad to have you join my Facebook group Creative High School English. It's a great place to get help and ideas when you're trying something new and wonderful, and I'm in there just about every day to help everyone connect and share ideas. As a writer, poetry is my genre of choice. As a teacher, I've engaged my students in poetry by using choreography as a form of literature response. I LOVE THIS POST! I can't wait to delve into the videos more deeply. Thank you! How wonderful to hear! And I love the idea of choreography as a way of responding to poetry! I've never heard of any teacher doing it, and it's a fabulous concept. We have an amazing dance program at the school where I work, and my mind is already humming... Thanks, Wild Child!